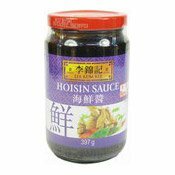 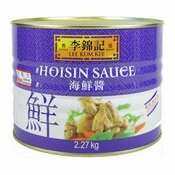 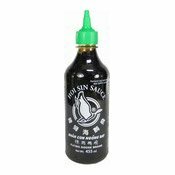 Hoisin Sauce is used as a dressing in crispy aromatic duck and as a stir-fry sauce in many Chinese classics such as Kung Pao Chicken. 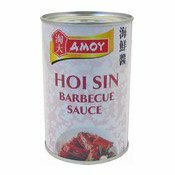 Also great as a dip and as a marinade for ribs and roasts. 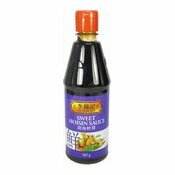 Stir-fry 1 tbsp minced garlic and 350g (20oz) shrimp for 2 minutes. 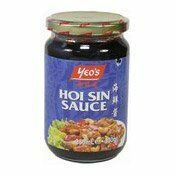 Add 120g (4oz) each diced green and red bell peppers, 2 tbsp Hoisin Sauce & 1 tbsp Oyster Flavoured Sauce. 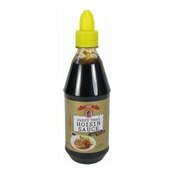 Stir-fry for 1 minute. 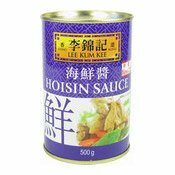 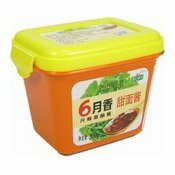 Ingredients: Sugar, Water, Fermented Soybean Paste (Water, Salt, Soybeans, Wheat Flour), Salt, Dried Sweet Potato, Colour (E150a), Modified Corn Starch, Dehydrated Garlic, Sesame Paste, Spices, Salted Chilli Peppers, Acid (E260).